I may be hopelessly old fashioned. Maybe just square. Some will claim that I am a bigot. Whatever it is, I am simply not ready for this! As an ex-Army officer, I admit that I am simply not ready for open homosexuality in our armed forces. Call me a bigot if you like, but I am simply not ready, and I doubt that I ever will be. A married Army general on Tuesday introduced his spouse at a Pentagon event that featured lots of top brass, including Defense Secretary Ashton Carter as the keynote speaker. What made this seemingly routine introduction noteworthy is that Brig. Gen. Randy S. Taylor introduced his husband, Lucas. “My husband Lucas is sitting up front here,” Gen. Taylor said of the man in the same row as Mr. Carter, ArmySecretary John McHugh and other senior officials. He said Lucas has subjugated his own career to support the general’s frequent moves over an 18-year relationship. 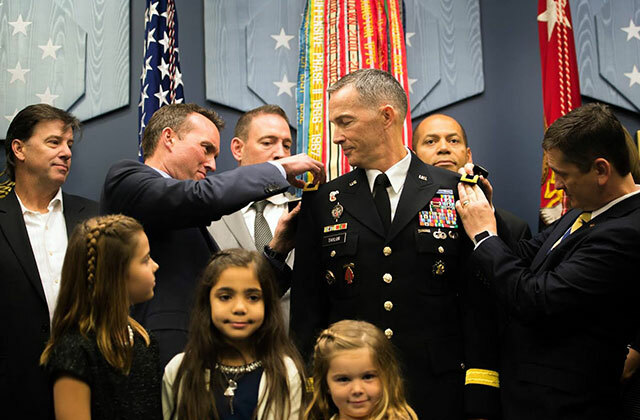 “We bet everything on my Army career,” said Gen. Taylor, whose 27 years of service spanned an outright ban on gays, then “don’t ask, don’t tell” and finally, the ban’s lifting in 2011. Gen. Taylor was the master of ceremonies for the Pentagon’s 4th Gay Pride celebration that showcases a month of gay-themed posters and history. A panel discussion featured a gay Marine officer, a gay Army sergeant who is a criminal investigator, a lesbian chaplain and a transgender, Amanda Simpson, who is executive director of the Army’s Office of Energy Initiatives.